The Philly Fed manufacturing index slowed for a second consecutive month and is nearly, but not quite in contraction. New orders and prices received are already in contraction. 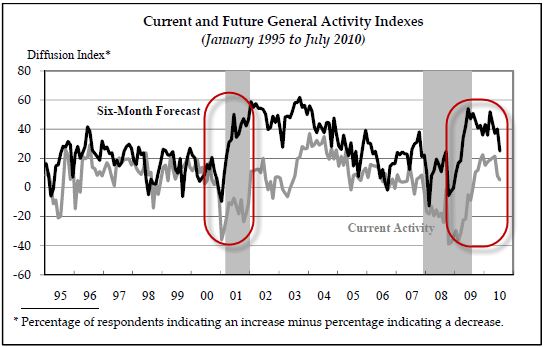 Please consider the latest Philly Fed Business Outlook Survey. Results from the Business Outlook Survey suggest that regional manufacturing activity continues to expand in July but has slowed over the past two months. History shows gaps narrow over time and most of the time are in sync, except at turning points. The key question which we will get to in a minute is "Will the gap narrow by future expectations falling or current conditions rising?" Note that prices received is in contraction for a second consecutive month. That is not good for profits to say the least. Also note that new orders are falling. That is also not good for profits. 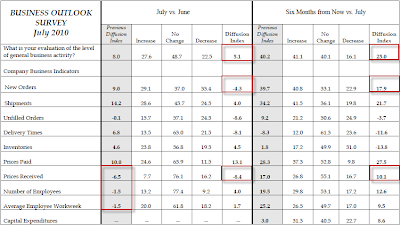 Yet, the overall diffusion index is 5.1 now vs. +25.0 six months from now, new orders expectations -4.3 now vs. 17.9 six months from now, and prices received -6.5 now vs. 10.1 six months from now. 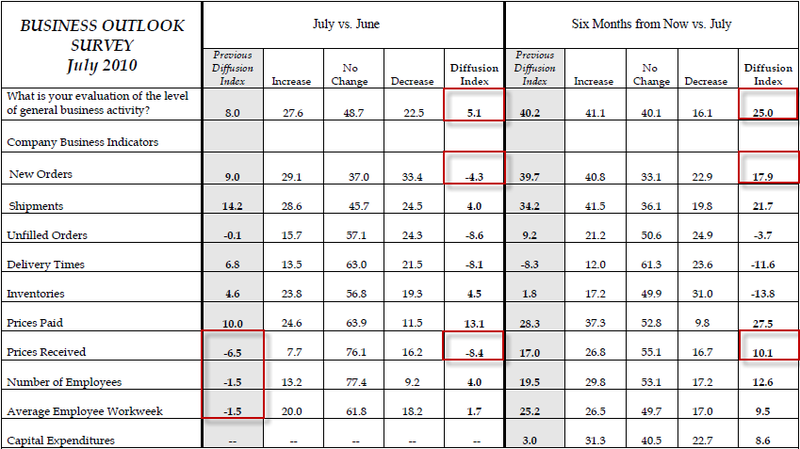 Also note that Employees and Workweek were both in contraction last month but are now barely positive with expectations higher again. If manufactures are ramping up production, even modestly, in expectations for a better second half, they are going to regret it. Data suggests durable goods sales are about to collapse. I made the case for a significant manufacturing slowdown in Expect Second-Half Housing and Durable Goods Crash. Please take a look. Manufacturers may be more optimistic six months from now, but consumer attitudes suggest something dramatically different. Ramping up production is the wrong thing to do.